Seriously. Even if the movie looks to be bad in the trailers, if it's a franchise movie of a beloved geek-focused literary or televised series, YOU WILL GO SEE IT. Ant-Man is a perfect example. I didn't want to see it. I didn't NEED to see it. The trailer looked... weak... foolish somehow. I figured beforehand that I could simply skip it coming out in the theaters and waiting for the DVD/Blu-Ray. ...I ended up going last Sunday during its first weekend. This is all just lead-in to one of the funniest YouTube animated series I've just come across called FanGirls done by OnlyLeigh. ...I loved how the lead insurgent was from House Stark. And the eyebrow twitch she develops as Leigh speaks to truth. Anyway. Next Saturday is Tampa Bay Comic-Con. See you there! I was chatting up a co-worker at the Bartow Library tonight about how things were at the other libraries we've each worked at, and I got to thinking about the ones I used to work at in Broward County. The surrounding north-and-northwest libraries were places I'd go to help as a Reference librarian, or in some cases as a Librarian-In-Charge (someone with the authority to panic if there was a crisis). I'd go to branches like Coral Springs, a busy mid-sized library before it was replaced by its own Regional (Northwest Regional, where I would work as a full-timer for awhile... but that is another story). I was a frequent LIC at the smaller Northwest (no relation, this was NW Pompano Beach city) and Margate branches. I went twice to Beach branch (Pompano), one of the smallest libraries I had ever seen, with an absolutely beautiful view of the Atlantic Ocean right across the street. I covered the Reference desk about four, five times at Pompano Beach branch. There was another library somewhere in the middle - not Lauderhill, but nearby - where I had to cover once, but I can't recall specifically which it was. Might have been Tyrone Bryant. Ah well. Talking about the years I worked at Broward made me wonder how things are down there now. I hadn't worked there since 2003, twelve years going on forever it seems. So I looked at the website and checked out the map to see what was different. I knew some of the buildings had changed. South Regional, years ago, that old building was leaking every rainstorm so they needed a new place and got one. West Regional when I was there had been built just before the need for public computers everywhere, so that was a smaller place one-story structure than the county residents deserved. They replaced it with a larger two-story place, which looked nice the time I visited a few times. I heard that tiny Beach branch finally closed: a storm in 2005 wiped out the Pompano pier across the street, and the library itself was damaged. They built a newer one further inland - which isn't far, seeing the Intercoastal Waterway is about a mile from the Atlantic - that looks like double the size. The community Northwest looks like it has been replaced. The old building was small, barely four rooms. The photo on the locations page looks like a fancier, larger abode. Pity they don't have more photos of what it looks like inside now. Did they get a larger Children's room? I noticed on the map that two libraries are no more: there were both a Tamarac Reading library and a West Atlantic (Blvd) Children's library. The Tamarac Reading was meant to be a temporary location while the old Tamarac library phased out for a newer building, and the West Atlantic was meant to relieve some of the checkout demands at Coral Springs. But they were both in major population areas - the suburbs - and when I left I heard their neighborhoods were fighting to keep them. I thought at least the West Atlantic place would remain standing: partly because if you look at the map there's a need for a library west of Coral Springs Drive on Atlantic Blvd, partly because I knew the Northwest Regional up the road was one of the busiest and stressed-out libraries in need of some circulation relief. Side note: if you look at that map - I can't add that as an image here due to formatting - the county needs another branch or two in Coconut Creek towards Parkland and somewhere off Sheridan and State Rd 7. Ahh, I do miss a few things from South Florida... some of the co-workers I knew as friends... the occasional drive down the beach between Pompano and downtown Ft. Lauderdale... movies at Sawgrass... watching Bucs games at Hot Shots off University Dr. Hmm, memories. Just received word that History and Mystery Oh My! 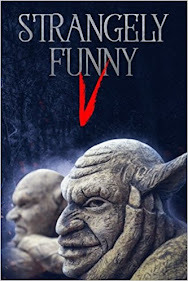 is a finalist for the Short Fiction award presented by the Florida Authors And Publishers Association's President Awards. Many congratulations to Sarah Glenn and Gwen Mayo for the nomination, and here's hoping they win it on August 8th! It's been ages, but one of the earlier websites I remember as a pro-librarian site was Library Avengers. Thankfully, it's been one that's stayed relatively active, occasionally updated, and still relevant to today. 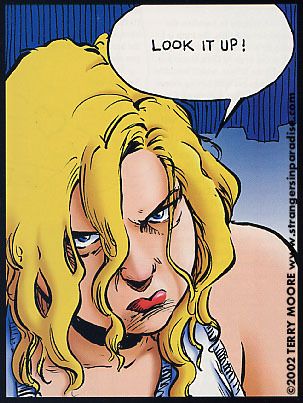 From Terry Moore's classic Strangers In Paradise. posters for sale of that artwork. Caturday for the 4th of July! But I'm also on vacation at the moment.